Publié le juin 14, 2015 par admin & classé dans Uncategorized. 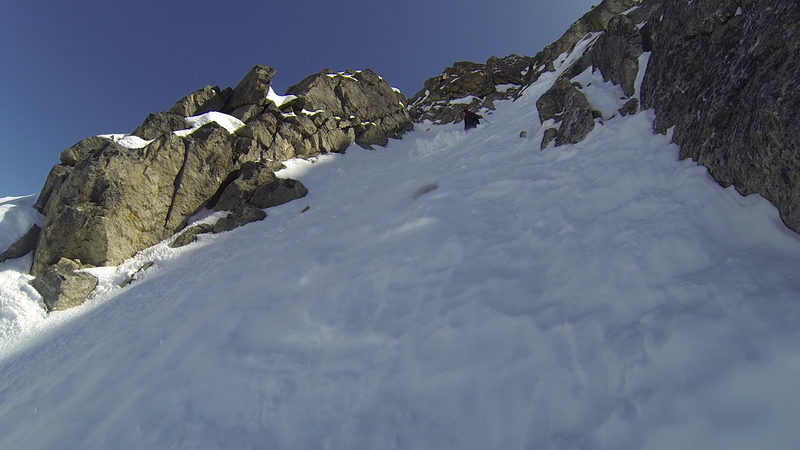 In Spring 2013, Davide and I got our first close look at the impressive North face of Mt. Emilius. 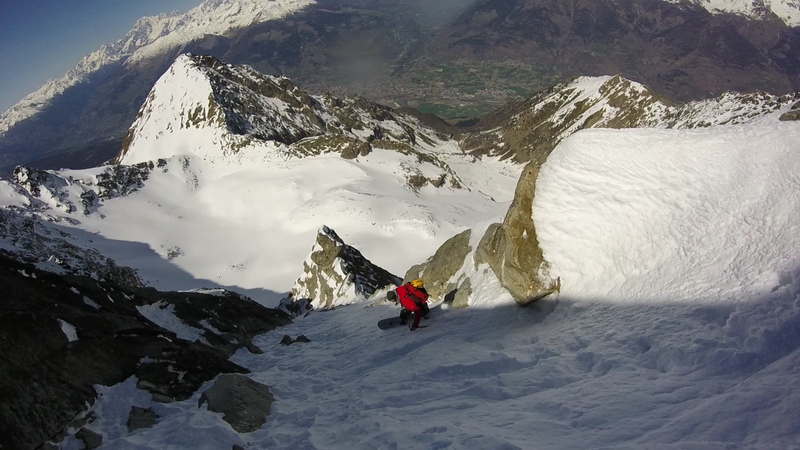 We didn´t dare try this bold line that day, but instead went riding on the North face of the Becca di Nonna, one of Mt. Emilius smaller neighboring peaks.Over the next two seasons, Davide and I rode two more of Mt. Emilius’ neighboring faces: North face of Tersiva, and in Jan 2015, the first descent of the North face of Punta Garin. Now the only peak we has left to ride in this range was the main and highest summit, Mt. Emilius.We’ve had terrible conditions in the high mountains of the Alps this spring, not many options to ride. 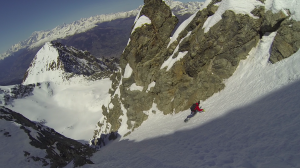 When Davide showed me a recent picture of the North face of Mont Emilius it looked dry, but on closer inspection, the lower couloir actually did seem snowy enough to get to the summit ridge. Despite the long approach, on April 13th we decide to go and get a closer look at the snow coverage and see how steep the terrain really was. Starting from Pila village at 5.30 am, 4 hours of intense touring brought us to the bottom of the face. 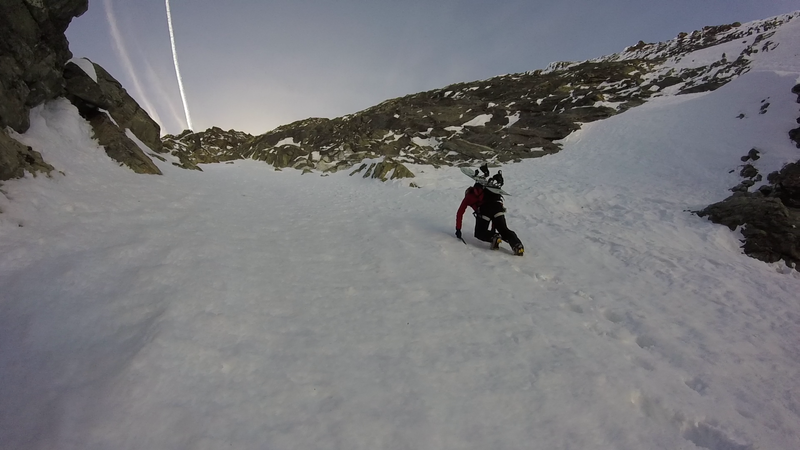 The face is really steep but luckily, our objective is the weakness in the wall and the couloir looks rideable. The snow in the first North facing hanging ramp is cold and powdery but unfortunately the aspect changes to West a little ways up. The few hours of sun the west faces gets in the afternoon has made the snow icy. Two 30 meter rappels later and we’re back at the top of the couloir, putting our boards on. 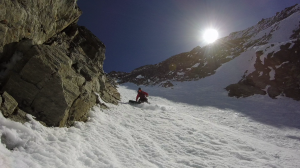 The sun is getting closer to hitting the couloir and we know that in a few hours it will warm the icy snow into a nice corn, but we don’t feel we have time to wait. 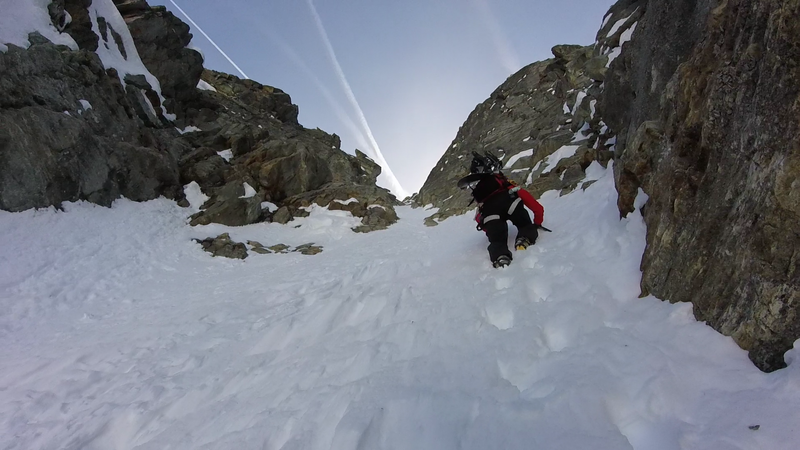 Our descent to the valley is still long and dangerous and the snow was already soft early morning. 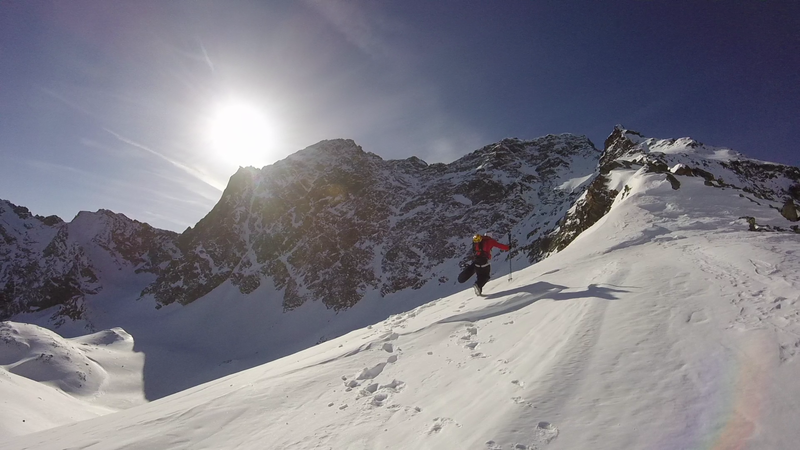 We decide not to wait until the snow softens in order to have a safer way back from the mountain. 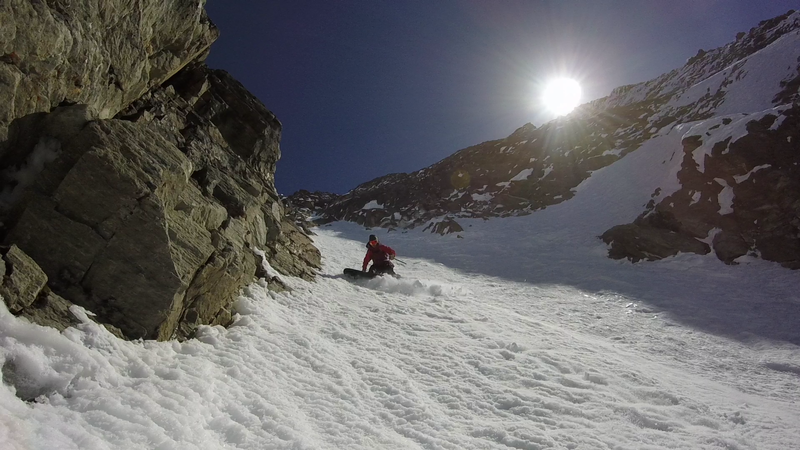 The couloir is steep but the snow is grippy enough to allow calculated turns. The view over the green fields of the Aosta Valley provides an amazing contrast and we feel lucky to be here on our boards. 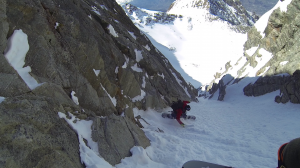 Slowly the couloir becomes a bit less steep and we gain confidence on the difficult snow. 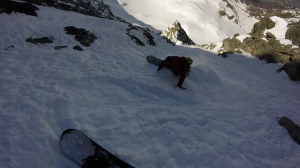 A few nice turns in the last ramp and we are quickly back to the bottom of the face. The descent down to the valley takes us as long as the morning approach and we ride some of the most rotten snow we have ever experienced. In the end we put in an 11 hour effort and we’re both really happy about our first experience on Mt Emilius. Definitely ready to come back next season for an attempt from the summit. Thanks to Davide for another amazing adventure in this region and to the splitboarding revolution for allowing journeys like these!